Teams coached by recently added assistant Gary Kubiak teams have long prioritized zone running schemes that helped make Terrell Davis a Hall of Famer and turned Arian Foster into an elite rusher. After a torn ACL ended Dalvin Cook’s first season in the NFL and hamstring injuries cost him the better part of six games in 2018, it’s reasonable to expect a healthy Cook can surpass his career numbers in one season next year. In just 15 games and 14 starts through his first two NFL seasons, Cook has produced a tantalizing taste of just how dynamic he could be with an injury-free season. He’s carried a modest 207 times in his career, posting 969 yards on those attempts, and caught 51 passes for 395 yards. It adds up to 1,364 yards from scrimmage, along with six touchdowns, in Cook’s first two NFL seasons, and the Vikings are likely banking on him being able to do even more in 2019. Gary Kubiak’s addition to the Vikings’ offensive staff — which was said to be at the direction of offensive coordinator Kevin Stefanski — figures to further solidify the identity of the team’s offense behind Mike Zimmer’s vision. Kubiak’s teams have long prioritized the zone running schemes that helped make Terrell Davis a Hall of Famer and turned Arian Foster into the NFL’s leading rusher in 2010. If Rick Dennison — Kubiak’s longtime assistant — comes to the Vikings, as expected, in the offensive line coach/run game coordinator role he held with the Jets last year, he’ll join tight ends coach Brian Pariani among Kubiak’s longtime assistants. Kubiak’s son Klint, who returns for his second stint in Minnesota as the Vikings’ quarterbacks coach, has a strong relationship with Stefanski, as well. A unit that struggled to find its identity last season is making an effort to establish more cohesion in 2019. If the tenets of Kubiak’s offenses come to Minnesota, it’ll mean plenty of zone runs, more snaps with quarterback Kirk Cousins under center — Kubiak’s teams have frequently put QBs under center more than any offense in the league — and the kinds of play action throws Cousins executed with success in Washington. How does that help Cook? For one, it likely means a more defined role in the offense, as long as he’s healthy enough to play it. He didn’t carry the ball more than 19 times in a game last season, after logging 22 and 27 carries in two of his first three games in the NFL. That figures to change in 2019. It’s also worth noting that Cook got all but nine of his carries with Cousins under center during Stefanski’s three-game stint as the offensive coordinator. Cook gained 53 yards on his nine shotgun carries, but did perhaps his best work from behind Cousins against the Dolphins, when he took 15 carries for 108 yards and a pair of touchdowns with Cousins under center. The day after the Dolphins game, coach Mike Zimmer said he thinks “Dalvin can run from the gun or under center,” and added, “I think some plays are just a little bit better under center than they are from the gun, but he can do both really well.” In any case, Cook should come into the season with a fairly clear sense of what he’ll be doing, and he could find the ball in his hands quite a bit more next season. There are a couple caveats here, of course: The Vikings need to build an offensive line that can consistently open holes for Cook, who gained 233 of his 615 rushing yards on plays that counted for 15 or more yards last season. 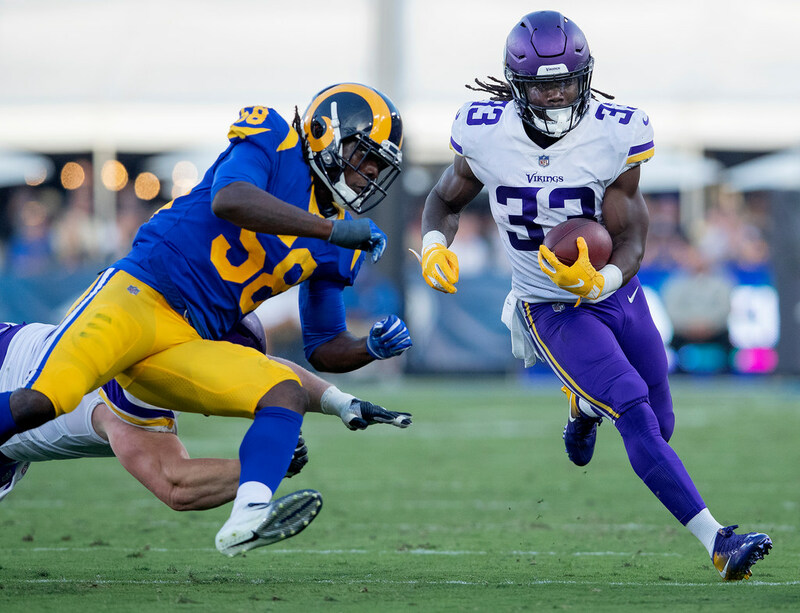 That tied him for the 12th-largest percentage in the NFL of yards gained on explosive runs, according to Pro Football Focus, and while it’s nice to have a back that generated 17 gains of 15-plus yards in his 173 rushing and receiving touches, the Vikings also need to cut down on the percentage of Cook’s runs that are stuffed at or behind the line of scrimmage. A better line would help, but so would Cook dialing back a tendency to dance behind the line of scrimmage. According to NFL Next Gen Stats, Cook traveled an average of 3.97 yards for every yard he gained beyond the line of scrimmage, which tied him for 32nd among the 55 backs with at least 85 carries last season. He’s not likely to be a pure north/south runner, nor does he play in a scheme that requires him to be, but a touch more efficiency could help get more out of his carries. The Vikings also need Cook to prove he can stay on the field and consistently handle a feature role; being a year further removed from his ACL surgery should help him there, but his hamstring injury was one of several that lingered for a sizable chunk of the season for the Vikings. All that said, however, if Cook is ready for the opportunity, it’ll likely be there for him. Playing for his third coordinator in his third season, he could be in line for the star turn the Vikings envisioned when they traded up to draft him in 2017. Time will tell if he can grab it. What if last year's Super Bowl week met up with this week's deep freeze?